Cable moved lower in early European trading on Monday after quiet narrow range action in Asia. Fresh weakness pressures again pivotal 1.29 support zone (Fibo 38.2% of 1.2397/1.3217 / 30SMA / 100SMA) which was cracked last week, but without clear break lower. Near-term bias remains with bears and favors fresh weakness in extension of pullback from 1.3217 peak (2019 high), following three-day consolidation last week. Fresh bearish momentum is building on daily chart and along with multiple bear-crosses (5/200, 5/20, 10/200SMA) maintains pressure. Brexit uncertainty which triggered flow of investments from UK, adds to negative sentiment. Traders await release of a batch of data from UK today (Q4 GDP 1.4% f/c vs 1.5% prev, IP Dec 0.1% f/c vs -0.4% prev, Manufacturing production Dec 0.2% f/c vs -0.3%, Trade balance Dec -12B vs -12.02B) which are expected to provide fresh signals. 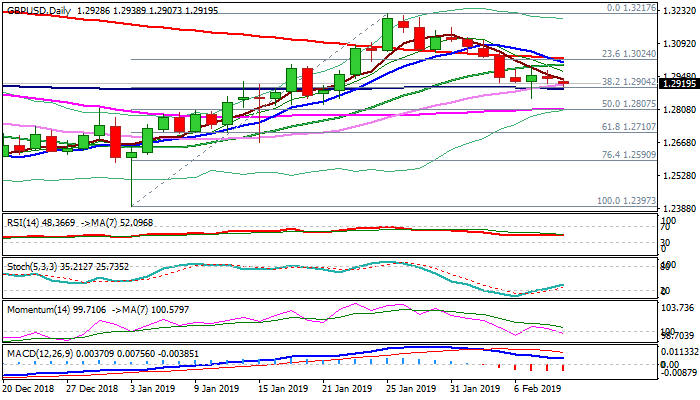 Sustained break below 1.29 zone would confirm bearish stance and open way towards supports at 1.2807 (50% retracement) and 1.2786 (daily cloud top). Repeated failure at 1.29 zone supports would signal possible stall of bears, however, extended congestion could be expected as long as the price action holds below falling 200SMA (1.3027). Only sustained break here would neutralize downside threats and revive bulls.